Open since early December right next door to JuneBaby in Ravenna, Lucinda’s Grain Bar is award-winning chef Edouardo Jordan’s third spot (with Salare making the oldest sibling). While many might think of the spot, named after Jordan’s sister and great grandmother, solely as a place to have a quick cocktail while waiting for a table to open up next door, don’t fall into this trap and miss out, because the cocktails, ambiance and food served in this intimate bar are worth a visit for their own sake. Lucinda isn’t a large place, but I think that’s a plus, as we have too few really good small bars, which tend towards that cozy feel usually lost in larger places. You’ll find only 20 odd seats, some at small wood-topped tables, some at an L-shaped bar-rail along one wall facing the streetside window, and four bar stools at the marble-topped bar. The friendly staff, starting with lead bartender (the fantastically named Tremor Arsenault), enhances the coziness. He and the staff greet all comers in a welcoming manner, even when it gets busy, which it does quickly once JuneBaby fills. You’ll find him there nearly every night, whipping up drinks created by Elmer Dulla, the bar manager (and director of operations) for all of Jordan’s places. While Dulla made the menu, bartenders like Arsenault are encouraged to be creative and try new things, too. There are eight cocktails, all interesting takes on classics. 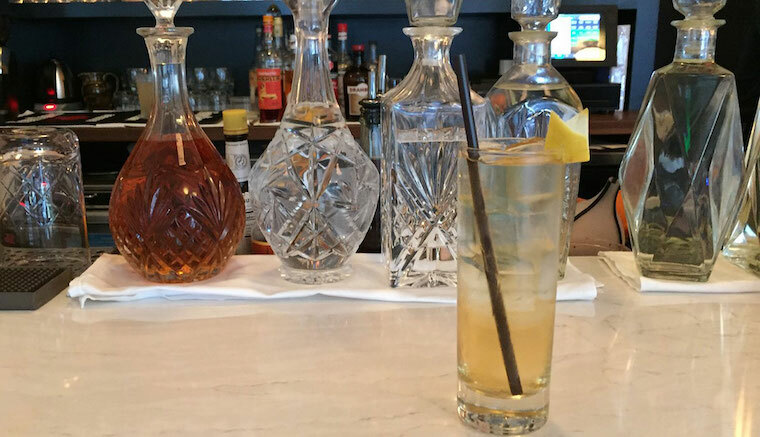 I started with a Calvados Highball highlighting an intriguing pairing: French apple-brandy (Calvados, that is) and Drambuie, the Scotch-based liqueur made with heather honey and secret herbs, and topped with effervescent Perrier. A little lemon zest also comes into play, really, as Arsenault said, “opening up the Drambuie and apples.” It’s a drink whose fruit and fresh notes will have you dreaming of spring, while the brandy helps keep you warm through winter—and it goes divinely with the fermented vinegar-y pickled veg off the Snacks section of the menu. A nice and tight list of wines and beers is available, too, and a range of spirts shelved behind the bar (including solid locally made tipples from 2bar, Westland and others), but the cocktails are so well-crafted, with a number of house-made ingredients in cut-glass decanters on the bar, that I’d stick to them. For example, if the temperature is still residing in the chiller digits, try the Barley Old Fashioned, with bourbon, cardamom (such a great cocktail spice, thanks to the citrus notes it brings) and homemade rich barley syrup. Yummy. That drink’s also well connected to the overall grain-iness of Lucinda’s—it’s not called “grain bar” for nothing. Beyond the grain notes within some drinks, the food menu features a wide array of different grains. It starts with Snacks, alluded to above, with items like the multigrain crackers that come with a trio of dips (chickpea, eggplant and a beet yoghurt), but really ramps up in the Grain Bowls. Each of these highlights a different grain: einkorn, black rice (which, with broccoli, cauliflowers, shallots, sultanas and sesame is ideal for veggies) and more. The freekah bowl—freekah is made from green duram wheat—is a top choice, containing roasted lamb, Brussel sprouts, delicata squash and lentils. You can see from the mouthwatering menus above why I believe Lucinda’s stands tall on its own merits, as well as being an amiable waiting room. And I haven’t even mentioned the sandwiches. With bread, like the crackers, and the sauces, yoghurt and more made in house, they’re worth talking about. The Berbere meatball with Parmesan, olive tapenade and preserved toms is Arsenault’s favorite, and I’d trust him if you’re a meat eater. If not, there’s a goat chevre and porcini pick that looks delicious. There’s even an einkorn ice cream with oats, quinoa and sorghum porridge. One last note: while the décor is contentedly minimal (a high shelf on a few walls with bottles, glass containers full of grains, little blue Le Creuset casserole dishes and such), there was one object that instantly rose up my “neatest bar accoutrements” list. The bar has a brass foot rail, as you see in many spots. But this one features four lion heads with open mouths biting the rail. It’s a lovely touch, and mirrors the lovely touches that make the drinks and food, and whole bar, worth traveling for all on its own.